The roles of women, men, and other family members have changed during the history of Finnish small-scale fisheries. Generally, the most significant unit of the livelihood is the household, but fisheries have been of major importance also in the local community. Cooperation in fisheries has been quite common and in the past local community provided also employees for fish processing factories. Today, many coastal fisher families process their own catches and sell the products directly to consumers in fish marketing events. In this marketing strategy, women are typically in core role, although quite often women’s labor can be considered as “invisible work.” Today 9% of Finnish small-scale fishers are women. In many cases, fishing is not the only source-generating income in a fisher household, and often the wife of the family earns a steady income that keeps up opportunities to sustain the uncertain fishing livelihood. In our article, we examine women’s and men’s participation and roles in fisheries households and communities. We also study how these roles have changed over time and in what way are women’s and men’s contribution represented in statistics, politics and research. The study rests on case analyses and a collection of literature and interviews. This article focuses on gender roles in small-scale fisheries in two regions along the Finnish coast of the Baltic Sea. On one hand, we examine the changing roles of the household members and, on the other, we study how women’s and men’s contributions and knowledge have been represented in statistics, politics and research. Previous studies on fishing-related gender themes—such as women’s and men’s work, relations between women and men, and women’s and men’s identity—are few, especially in the recent years. More often, these themes have been presented as a part of more general historical analyses (e.g., Nedrum 1998; Storå 2003). We draw an introductory picture of the situation by resting on a combination of historical material and recently conducted ethnographic studies. The analysis is based on the theoretical framework of political ecology, more specifically feminist political ecology, which addresses the question of gendered work and knowledge and how they become invisible. Moreover, we discuss how the gendered knowledge and women’s work in fishing households have been demonstrated, and what can be done to improve the negative effects of invisibility and marginalization. Throughout history, the availability of fish resources has been of crucial importance for inhabitation of coastal areas of the Baltic Sea. Fish and seals have been of major importance even in the food cultures of Stone Age coastal dwellers (Pääkkönen et al. 2016). Brackish water and cold wintertime create a unique and challenging environment for the Baltic Sea water fauna and utilization of the natural resources. Over centuries, the coastal inhabitants and island dwellers have formed their livelihoods around fishing, trading, and agriculture. According to Eklund (1994), the period from 1918 until 1939 was characterized by professional fishers and fishing peasants. Especially in the archipelago, fishing was typically combined with small-scale agriculture. After the heydays of Finnish commercial fisheries in the early twentieth century, the livelihood opportunities became disrupted due to urbanization, globalization, and environmental changes. In addition, the recent societal emphasis towards recreation and nature conservation has further increased the small-scale fishers’ profitability problems and competition between different water user groups (Salmi 2015; Sonck-Rautio 2017). The possibilities for coastal fishing have become even more limited, as the populations of fish-eating and protected seals and cormorants have increased, and top-down fishing restrictions have become stricter. The remaining fishing households try to adapt to the changes, for instance, by concentrating more on fish processing and direct marketing, thus improving the value of their catch (Salmi 2015). In this strategy the roles of women are of particular importance. The Finnish coastal fishery is a small-scale and family-based activity that uses a wide range of fishing methods for targeting various fish species, such as Baltic herring, pikeperch, European whitefish, Baltic salmon, and perch (Salmi and Mellanoura 2018). Although the economic significance of commercial fisheries has generally decreased, the fishing livelihood is still highly valued in many coastal villages. The fishers appreciate the independent life-mode at sea and the continuance of local fishing culture. The interests and values of the small group of 2428 registered commercial fishers have become marginalized in the decision-making system in comparison to farmers, for example (Salmi and Mellanoura 2018). More than two thirds of the coastal fishers are part-time operators—largely due to seasonal fish availability. The proportion of women in Finnish small-scale coastal fisheries has been estimated at 9% (Salmi and Mellanoura 2018). Swedish-speaking fisherwomen1 along the coast and in the archipelago were active in representing their interests during the 1990s, but this activity decreased at the beginning of 2000 (Talvitie 2003). In their most active years, the fisherwomen’s association aimed at fostering the rights and interests of fishing families at the local, regional, and Nordic levels of fisheries policy. Both quantitative and qualitative studies about women’s work in Finnish fisheries are rare, although some historical sources are available. In order to complement the retrospect analysis, the authors of this article have gathered case study material to shed more light on the contemporary situation. This empirical material provides a comparison between two significant commercial fisheries locations, namely the Archipelago Sea and the municipality of Merikarvia. 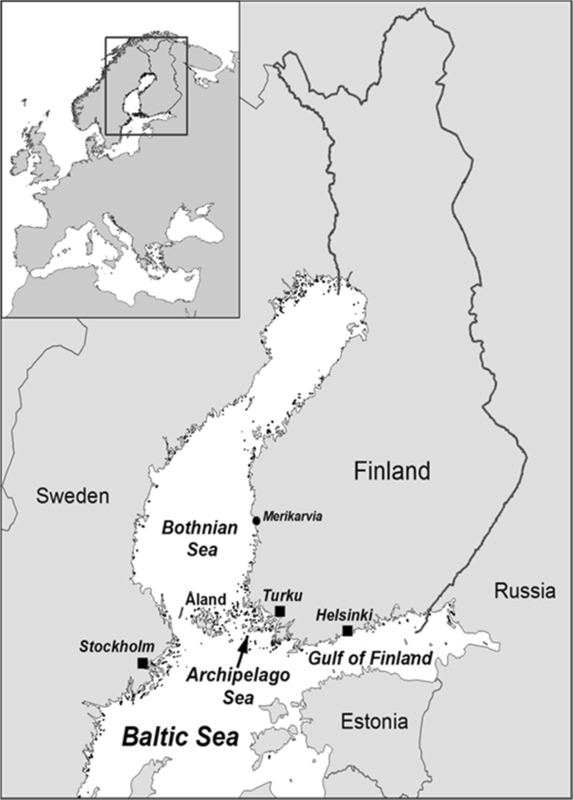 These study sites are located along the South-western part of Finland and the coast of the Bothnian Sea (Fig. 1). The Archipelago Sea area consists of more than 40,000 islands, making it one of the largest archipelagos in the world. The fishing culture and connected life-mode is still strong in the studied cases. In the small coastal village of Merikarvia, the fishing tradition, stories and social ties are highly valued—and also used in the local tourism business. Some commercial fishers have turned their strategy to tourism, based on the fishing culture and local nature. The Finnish coastal fishers population decreased sharply during the period 1950–1970, largely due to profitability problems, depopulation of the islands, and new year-round employment opportunities in factories (Eklund 1994; Salmi 2018). Thereafter, the number of fishers has continued to decrease. In the southern parts of the Archipelago Sea, there were 3447 fishers in 1934— but less than 100 in 2015 (Salmi 2018). In the whole Archipelago Sea, the number of full-time fishers in the 1980s was circa500, while in 2013, the total number of commercial fishers was 290, 89 of which being full-time operators. In Merikarvia, the number of commercial fishers was at its highest (more than 300) in the early twentieth century (Salmi 2010), decreasing to only 14 at present (unpublished demographic material of Fisheries statistics division in Luke). The theoretical framework of this article is based on political ecology, which focuses on relationships between politics and ecology. The concept derives from political economy and addresses the concerns of ecology. Political ecology shows how scientific knowledge about the environment is made and for whom. Further, it addresses the questions of social injustice and marginalization, and how the environment and its resources are available to some and not to others. It also examines the context of ethnicity, class, and race (Blaikie and Brookfield 1987; Robbins 2012; Neumann 2014). Feminist political ecology adds to this framework with a focus on gender. With their pioneering work, Rocheleau et al. (1996) introduce critical themes in feminist political ecology, which examines the questions—such as environmental conflicts or struggles over knowledge and power—from the perspectives of gender. Among the themes included in feminist political ecology, the most relevant to our case is that of “gendered knowledge.” This gendered knowledge often remains unnoticed when conducting research on any group, including fishing communities. Rocheleau et al. (1996) concur that women have been misinterpreted or even devalued by science, and that their ways of knowing have not been appreciated. Feminist political ecology, although recognized long ago, has not been widely put into practice. This is not because the need for such research has diminished or because it would have been regarded as irrelevant; on the contrary! As geographer Rebecca Elmherst (2011) points out, there are several studies available which address these issues, but they are not labeled as feminist political ecology. We find that our article fits well into the feminist political ecology framework and benefits from the themes and viewpoints that feminist political ecology has to offer. Researchers (e.g., Koralagama et al. 2017; Neis et al. 2005; Munk-Madsen 1998; Gerrard 1995) have pointed out that gender discrimination comes out in many forms. Small-scale fishing around the globe suffers from the lack of possibilities to participate in decision-making. Many fishers feel they are ignored and left on their own. Access to resources, as well as power to make decisions, can also be denied due to gender. One form of gender discrimination is identity-based discrimination, which can also be committed by women themselves, while creating roles based on their culture (Koralagama et al. 2017). The authors emphasize that gendered knowledge may be misjudged as irrelevant, not only by science, but by the community itself, including the women. This type of knowledge can also be tacit knowledge that exists in silence and is learned via experience and oral tradition (as defined by Julie Cruikshank 2005). Tacit knowledge can be, and often is, “hard to explain” as one has difficulties to find words for expressing it. It is gendered, since gender roles define the tasks and environments from which the knowledge can be learned. Gender can also be the factor defining to whom knowledge is transferred. In this article, we ask: is gendered tacit knowledge linked to the invisibility and ignorance of the women’s work in fisheries? What kind of historical processes contribute to the women’s and men’s roles and marginal position in the sector? As long as women’s contribution to the fishery and the fishing households is not seen, it cannot be documented. Thus, their contribution remains absent from statistics, other quantitative data, and policy documents. This invisibility (Koralagama et al. 2017; Frangoudes et al. 2014) can be explained, for instance, by the fact that fisheries research focuses essentially on the catching sector and fish stocks rather than marketing, fish processing, and the household economy, in which women’s efforts are important. Gender-neutral research easily evolves into gender-blind research, researchers having difficulties to even find women for interviews since it is so common for men to represent the whole household (Bennett 2005). In this article, we examine changes in gender roles, household strategies, and division of labor in the Finnish small-scale fisheries, by comparing historical developments in the Archipelago Sea and Merikarvia during the period of 100 years. The case of the Archipelago Sea is supplemented by historical material also concerning the neighbouring archipelago, the Åland islands. The historical descriptions are mostly based on secondary material-like book chapters, research and newspaper articles, and various kinds of reports. In addition, we present a historical example of cooperative winter seine fishing community of Rymättylä in the Archipelago Sea. This section is based mainly on interviews with old fishers and their family members. The description of contemporary coastal fisheries is based on fieldwork conducted in the Archipelago Sea and Merikarvia during the period from 2007 to 2016. This material includes interviews with fishing household members and local fisheries experts. The total number of in-depth interviews used in this article is 14. At the end of the following section, we present two cases: one describing the contemporary household strategies and division of labour in a fishing household in Merikarvia and a parallel case study in Parainen, which is a municipality in the Archipelago Sea region. The material used for these two examples was collected by conducting in-depth interviews in 2017. During the early twentieth century, the division of fishing-related work between men and women was distinctive, but there were also differences among local cultures and regions. In the Merikarvia region, fishing for Baltic herring with large and heavy gill nets was labour-intensive and the fishing work on the sea was generally considered too heavy for women (Salmi 2010). As men came back from their fishing trips, women were responsible for taking the fish out of the net, cleaning, and salting the catch. Before the adoption of synthetic fibers in fishing, women weaved the fish nets, assisted by children. Before the World War II, wives were also typically responsible for the household economy. In many families, problems occurred when the fishermen, typically during the marketing trips, spent the fishing income on alcohol and cards (Salmi 2010). Nerdrum (1998) has named one of the ideal types of women living in the Archipelago Sea before the 1950s as “fisherwoman.” The fisherwoman lived with her family on a small remote island. Typically, the household owned two–three cows and eight–ten sheep. The woman was responsible for the domestic work and the cattle, but she also went fishing with her husband. The fisherwoman rowed the boat when the husband took care of the nets. She would also fish alone or together with other women if the husband was not home. During the first half of the twentieth century, the archipelago women were—as in Merikarvia—most often responsible for taking the catch out of net and gutting the fish, while lifting up the nets for drying was men’s job (Storå 2003). Salting of fish was a demanding task done by experienced men. In the early twentieth century, fishing was of primary importance for the livelihood of people inhabiting the outer archipelago (Salmi 2018). This was the case, for instance, in the island of Kökar, part of the Åland islands, where fishing had been at the heart of the local livelihood for centuries—until recent decades. An important part of the annual circle was the intensive fishing in August and September to catch fish sold in the fish marketing events in Turku and Helsinki (Sundström 2016). Women were often responsible for the customer service and children helped their parents in various tasks (Sundström 2016). The fish marketing trips, and the related work period in autumn, generated a major share of the annual income for the fishing households. During the first half of the twentieth century, fish processing factories were constructed in many Finnish fishing communities. In Merikarvia, several herring salting factories employed a large number of women, girls, and boys (Salmi 2010). Wooden pots for salting were also manufactured in the same village, which made Merikarvia one of the main producers of salted herring. Moreover, the fishers—only men at that time—traveled to the fish marketing events in major cities, like Turku and Helsinki, for selling their self-produced salted herring (Salmi 2010), as did many households along the coast and in the archipelago. In the Archipelago Sea area, women were employed by a pickled herring factory in the village of Rymättylä. In the late twentieth century, however, the fish processing industry diminished along with decreasing demand for industrial herring products. Today, various self-processed marinated herring products have displaced salted herring and have become one of the fisher households’ main selling articles. Selling and processing of fish is now more often a women’s responsibility. Nerdrum (1998) concludes that the main responsibility for boats and the maritime element was generally in the man’s sphere. In contrast to the Merikarvia case, however, many women in the archipelago have also been—and some still are—“independent” fishers. In the past, these female fishers often cooperated with men in capturing fish (Storå 2003). Many of the interviewed fishermen in the archipelago noted that their wives participated in fishing—some of them even mentioned their wives being professional fishers themselves. Almost all of the wives participated in some form, mostly in processing and marketing the fish. In some cases, the wives worked in a regular day job. They brought important income to the household, but in addition to that, they were also involved in the fishing livelihood. The modern Finnish coastal fishing can be described as a rather solitary form of subsistence – mostly involving one person or a household. Traditional winter seining in the village of Rymättylä in the Archipelago Sea provides an example of past communal fisheries. The history of winter seining goes back to at least the fifteenth century (Anttila 1968) and developed during the centuries in many ways, affecting the gender roles as well. Commercial winter seining in the archipelago area started in the 1880s. This fishing method ceased to exist gradually from 1995, due to the aging of the population, urbanization, changes in vocational structure, and finally due to the mild winters from the 1990s onwards: there was simply not enough ice anymore (Sonck-Rautio 2017). Each winter seine was owned by approximately eight–ten households. Winter seining employed practically the whole community during the winter season, since it required a lot of manpower to harvest tens of thousands of tons of herring under the ice cover. In the winter seining community of Rymättylä, women were also able to fish. They usually quit winter seining once they got married and had children, as they became responsible for the household, livestock, and children. Once the children were old enough, the women were able to go back on ice. Children, on the other hand, where not allowed to participate until the age of 15, so that their school work would not suffer. The more physical and otherwise demanding or responsible was the role in winter seining, the more respected was the fisher. There were no restrictions for women to gain these recognized roles, provided that they were fit and strong enough—and some of the women did succeed in accessing the most respected tasks (Sonck-Rautio 2017; Sonck 2011). Women’s importance at home increased when winter seining cooperatives went on a seining trip to the outer archipelago, being away up to 2 weeks. Women rarely participated in these trips, with an exception of female cooks. Women who stayed at home would gather together for socializing. They could bring their children along and do handcraft together while their husbands were away. An important role for women was to be a hostess in the activity connected with winter seining. For example, the seine needed to be sewed together in autumn and again dissembled in spring. This would take days, and the men of the cooperative would gather in rotating turns to one house to complete the task. During these gatherings, the woman of the house was in charge of feeding the guests, taking care of coffee breaks, lunch, and dinner. The nature of the hospitability of each hostess was under microscopic scrutiny in the community (Sonck 2011). As the importance of the winter seining in the community decreased, the nature of socializing changed for women—men were no longer absent during the winter season, and could participate in the work at home, e.g., taking care of the cattle. This also meant that the rather close community of fishermen’s wives lost its function and the women’s responsibilities as hostesses also decreased. As the number of Finnish coastal fishers declined, most of the traditional fishing communities, like Rymättylä, dispersed. The coastal communities have become landscapes of leisure and environmental conservation (Salmi 2018). Along with this development, many cooperative forms and networks of capturing and marketing fish have discontinued. The importance of the household as the unit of organization is now more central among those fish producers that have survived. In small-scale fisheries, the household carries the economic, employment, and residential aspects of family life (e.g., Brox 1966; Jentoft 1989; Pettersen 2000). Households are also important units for livelihood adaptation to changing circumstances, such as societal constraints and opportunities, and seasonal and long-term fluctuations in fish availability. Thus, it is important to study the interplay between dynamics of the fishing household, its social environment and external conditions (Brox 1966). In a fishing household, at least one family member earns income from fishing. In contrast, a family enterprise (van Ginkel 2014) is often operated by relatives who live in a number of households: father and son(s) or brothers constitute the crew’s core. In the studied coastal regions, family firms are rare, but in some cases, two independent fishers cooperate in fishing operations and the generated income and costs are shared between their respective households. Wages are rarely paid to family members or others participating in the Finnish small-scale fisheries (Salmi 2015), due to the character of the work as self-employed entrepreneurs. Moreover, extra work load and high side costs, like insurances, decrease the willingness to pay wages. The wives usually benefit from their fishing-related work in a similar way as their husbands. Each work contributes to the fishing enterprise’s net result, which is calculated annually when producing the tax declaration. The surplus of the enterprise can be used for sustaining the household. Fishers whose work income generated by fishing activities2 that exceeds €3828 annually have to pay for pension and accident insurances in the same system as farmers (Mela 2018). The insurances are voluntary for other commercial fishers. The spouse and other family members who participate in fishing activities, are also entitled to be included in the insurance and pension scheme. If no wages are paid, the income is calculated on the basis of the person’s work load in the household’s fishing activities. Combining various income sources in a household (i.e., pluriactivity) has been an important adaptation strategy in Finnish fisheries. In the past, fishing work was typically combined with animal husbandry and small-scale agriculture in the archipelago islets, in which women’s major role was in raising the family and taking part in agricultural work. At the turn of the twenty-first century, some fishing households continued this traditional “peasant combination,” or fished full-time, while wage work and service production in the leisure sector were adopted as new forms of pluriactivity (Salmi 2005). Employment opportunities for women expanded in Finland along with the strengthening of the welfare State since the 1970s. As paid workers, the men typically operated in ships or ferries, but their wives were more often employed by the public sector. As a consequence, the wife’s steady wages guaranteed the continuance of fishing in many households. The introduction of subjective right for inexpensive municipal day care and early childhood education enabled women to choose more freely between staying at home or going to wage work. Our material shows that, during the most recent decades, the women’s roles in fishing households have taken many forms: women may take up a full-time or part-time job, contribute to the tasks of the fishing household—or do both. The women who were, or still are, involved in fishing-related activities take different roles. Some fish single-handedly or cooperatively with their spouse. More often women are in charge of selling or processing the catch, or both. Some take part in various activities: in addition to fishing-related work, they may engage in another livelihood for the household, such as running a restaurant or other tourism-related business. Here, we introduce two examples of household strategies and the related labour division. The first is a fishing family with husband, wife, and their children in Merikarvia. In fishing activities, the man from Merikarvia cooperates with a commercial fisher living in another household. They mostly use trap nets for targeting Baltic salmon and Baltic herring. The major part of their catch goes to wholesalers, but they also sell self-processed products directly to consumers during numerous fish marketing events arranged in larger cities. The division of work between man and woman depends on the season. In winter, the woman from Merikarvia sells small amount of self-processed fish in a market place, while the tasks of the man are related to the construction and preparation of fishing gear. After the ice-period in spring, the man starts the high season for herring and salmon fisheries that lasts until August. In autumn, however, the woman is in charge of income generation: selling their self-processed value-added artisanal products directly to consumers during numerous fish marketing events arranged in larger cities. This includes filleted, marinated, and smoked fish items. The man from Merikarvia has been the only registered fisher in the family, e.g., with regards to filling the mandatory catch information for the authorities. Thus, the important role of woman from Merikarvia in the fishing household has not been visible in the statistics or to the managers. In 2017, however, this situation changed with the adoption of an individual quota system3 in Finnish Baltic herring fisheries. The quotas were determined according to catch history. This became a problem because the man from Merikarvia and his fishing partner had increased their fishing intensity, i.e., the amount of trap nets, only recently. In order to reach a sufficient quota, the woman from Merikarvia was also registered as a commercial fisher with a quota of her own. Two quota holders in the family enabled herring trap net operations not unduly limited by the quota scheme. Our second example is a fishing household of a cohabitating couple in Parainen, a population center in the Archipelago Sea. For their household, the most important fish species are pikeperch and European whitefish. The importance of perch is also increasing. They do not sell their catch to wholesalers at all, but reach the customers by direct marketing and occasional sales for restaurants and local shops. They have made a great effort to develop new types of self-processed fish products. This development work and producing the new products is mainly a job for the woman. The man from Parainen mainly focuses on harvesting and transporting the fish, while he is also in charge of the smoking of fish. Both the man and the woman from Parainen take part in selling. An important marketing channel is the newly established local food marketing network, which is operated by social media. The woman is presently working within the family enterprise, but she plans to establish her own company for preparing new fish products, like various types of pastries. These pastries include traditional Finnish bun with fish filling, traditional Karelian pies, fish quiches, and also fish burgers and different kinds of fish pâtés. The woman from Parainen does not consider herself as a fisher, although she catches her own perches, which she processes and sells to her customers. The case studies show that the gender roles in Finnish fisheries have changed in time and are far from homogeneous between regions. In the past, the physical hardships in fishing work was considered an obstacle for women to go out to sea, as was the traditional division of labour emphasizing women’s role in child care and other domestic work. Among the fisher peasant families, women commonly took care of the animals and arable land. In the studied winter seining community, however, women and children participated more often in fishing activities, according to their physical and social abilities. Today in a modernized welfare society, fishing technology, such as machines and lighter gear materials, has made the work less straining. Children can attend day care, and domestic work no longer requires the same amount of time. Still the traditional gender-based division of work continues, but it is now based more on traditional social structures than on necessity. On the other hand, the case of the Archipelago Sea Region shows that the role positions are not always permanent: women have also been able to act as independent fishers. The organizational, economic, and emotional contribution of fishermen’s wives to the household is often crucial for its flexibility, versatility, and resilience (e.g., van Ginkel 2014). The above-described Finnish historical case of cooperative winter seining shows the high importance of women in the local community. At present, when the household is the central economic and social unit, the major role of women in Finnish coastal fisheries lies in the household-based strategy of fish processing and direct selling. In the two regions referred to in this article, there were interesting differences in the past gender roles concerning direct fish marketing. Until lately, traveling to fish marketing events was in the sphere of the men in Merikarvia, while in the Archipelago Sea Region, families had for much longer a stronger role in the marketing sphere. Women’s wide employment in the herring salting industry, especially in Merikarvia, may have added to the division of tasks between women and men, while in the archipelago, the tradition of pluriactivity has fortified cooperation within the family. According to Pettersen (2000), for instance, fishing in many Norwegian households implies that the spouse has paid employment, and the development of the public sector has offered stable and secure jobs, especially for women. In Norway, like in other Nordic countries, the increasing role of women as providers is connected to general changes in society, including their rising level of education and interest in outside employment and national policies of equal opportunity (e.g., Pettersen 2000). The situation is similar in the Archipelago Sea Region, where women’s wage work in the public sector is a relatively recent form of pluriactivity. The wife’s steady contribution to the subsistence of the household is often crucial for the continuation of fishing livelihood. The statistics do not show the wide occurrence of this type of fisheries pluriactivity. However, the field work conducted by Sonck-Rautio (2007–2017) shows that the phenomenon is rather common: ca. 60% of interviewees had a spouse wage working at some point. Feminist political ecology aims at identifying injustice, inequality, conflicts over resource, and struggles over knowledge and power. Finland is a pioneer in gender equality and the first country in the world to give women both the right to vote and stand for election (in 1906). Female political participation in Finland is higher than average in the EU and OECD. One explanation for the low willingness to participate in the fisherwomen’s movement was that women in Finland are in a relatively fortunate position and do not have to fight for their rights (Talvitie 2003). One indication of this was that, during the active period of the fisherwomen’s association, the emphasis was on fostering the rights and interests of the fishing families rather than those of the women themselves. Moreover, we see no big structural injustices in the legislation and basic position that would favour fishermen over fisherwomen, for instance, in the insurance or quota systems. Women and other household members have been, and still are, of substantial importance in the Finnish small-scale fisheries, and the division of labour seems to work well in most cases. The problems are more related to the practices adopted in management, statistics, and research that often tend to ignore the roles of women and other household members. Thus, the complex adaptive strategies of the diversified and pluriactive households remain invisible. Gender division and the importance of family members—whether officially registered as fishers or not—have rarely been recognized in Finnish fisheries statistics. This is obviously connected with an orientation towards fish stocks rather than fishers and their households among fisheries researchers and managers. Moreover, the tasks of the family members may be assumed as less important work, assisting the masculine “real fishing” at sea, which is ideally considered a full-time occupation. Because gender division among fishers has not been indicated in the fisheries statistics, the percentage of female fishers (9%) has been calculated following a request (Salmi and Mellanoura 2018). This figure, however, reflects the gender division among the registered fishers only. All family members are not required to be registered as commercial fishers: in many cases only the husband is represented. The wife is registered in case there is a practical reason for it, as in the Merikarvia case. There was no need for her to register before the fisheries policies were changed and the herring quota system was introduced. As a consequence, the bureaucracy in book keeping and catch monitoring has doubled. Nevertheless, a sufficient herring quota is needed for the continuance of their livelihood. The above-described types of invisibility are highly common everywhere (e.g., Bennett 2005) Hiding women from statistics undermines their role in fisheries. In research, many explanations for women’s poor representation are detected: for example, researchers are bound to seek informants from sites that are male-dominant, such as harbors and vendors, or interview fishers who have an active role in local organizations. And these tend to be men (Kleiber et al. 2015). It is also possible, however, that women themselves do not recognize their importance, skills, or knowledge. The winter seining fishers’ wives, for example, were very reluctant to be interviewed. Many of them claimed that they are not fishers and they know nothing about it. This was also the case with many wives of current fishermen. In most cases, wives were at home during the interview, but they spoke only after the official interview was over. It was clear that their knowledge on fishing and managing the fisheries was extensive, but they did not offer their opinions, even if their husbands noted that their wives did fish as well. This reluctance might be due the local culture of modesty, which requires women not to “make a big deal of themselves,” but might also be due to the fact that women rarely participate in fishing at sea, and therefore consider that they could not be of any use as informants. When the women take up this “ignorant” role, it is easy for researchers to ignore them also. Therefore, this gendered knowledge may be regarded as less valuable by both the scientists and the fishing community itself, thus further making their work and knowledge even more invisible. In case the gendered knowledge and invisible work reach the realms of science and policy-making, both tend to be biased and the invisibility of women’s role continues. We see the invisibility of women’s work and knowledge as an intertwined problem; as the women are absent in statistics, so is their knowledge lost in research. Fishers in general are left out of decision-making processes, and fisherwomen are even more so since their voice is rarely heard and their work is unseen. Fishers can be seen—in the spirit of political ecology—as marginalized, but fisherwomen are even more marginalized within that group. Increasing women’s involvement in research could enhance their visibility and also bring forward important material for policy-makers and resource managers. We need new approaches in statistics, but also new qualitative insights from the people who participate in small-scale fishing, especially the women. Making women’s work more visible could promote their professionalism, thus adding value and attractiveness to their line of work. It could also support important tasks, such as keeping up with social life (and social media) and product development, which could enhance the profitability of the livelihood. The term fisherwoman (“fiskekvinna” in Swedish) refers here to women who play an active role in a fishing household. Fishing activities include fish capturing, processing, marketing, and gear maintenance. The new Finnish individual transferable quota system applies to trawl fisheries for herring and sprat and to coastal herring trap net fisheries and salmon fisheries. The general principle, including a few exceptions, is that both the use right (share of the total quota) and the annual quota can be sold. New entrants, including fishing household members who have not been registered previously as a fisher, receive a non-transferable quota for a 5-year period. We would like to thank the reviewers for valuable suggestions to strengthen the argument presented in this paper. This article is based upon work from COST Action Oceans Past Platform, supported by COST (European Cooperation in Science and Technology). Gerrard, Siri. 1995. When women take the lead: Changing conditions for women’s activities, roles and knowledge in North Norwegian fishing communities. Social Science Information, 1995 - journals.sagepub.com. Kleiber, Danika, Leila M. Harris, and Amanda C.J. Vincent. 2015. Gender and small-scale fisheries: a case for counting women and beyond. Fish and Fisheries 16: 547–562. https://doi.org/10.1111/faf.12075. Mela 2018. MYEL-vakuutus. Kalastaja. https://www.mela.fi/fi/elakevakuutus/myel-vakuutus/kenelle-vakuutus/kalastaja Accessed 20.3.2018.